For most of us, somewhere between the ages of 25 and 35 is the sweet spot. It is when the very first fine lines have begun to appear but have not yet had the chance to develop into full fledged, deep set wrinkles. We used to notice these lines only when we made certain facial expressions. But now, we start to see them even when our faces are perfectly still – and we don’t like it one bit. Enter: Baby Botox. Our muscles of facial expression contract to make us raise our eyebrows, squint, scowl, purse our lips, and smile with our eyes. Over the years, the muscles strengthen and cause the skin to crease. Creases turn into fine lines and then deepen into wrinkles. While age is a big factor, having an expressive face, sun exposure, smoking, and genetics all play a part in when and how much we will wrinkle. The antidote – Botulinum Toxin is injected into muscles to relax them. And relaxed muscles no longer crease the skin, allowing fine lines to fade into the sunset. In a person with faint lines and weaker muscles, we can utilize a relatively small dose of Botox to completely eliminate the lines. Baby Botox leaves the skin appearing smooth, but more importantly, prevents wrinkles from setting in. Since the wrinkles were never allowed to appear in the first place, Baby Botox looks subtle and natural. While typical Botox lasts only 3 months, people who start early usually enough get significantly more time out of their treatments. Once a person has crossed over into more prominent musculature and deeper lines, Botox still works (phew!) – but more product must be used and more frequent injections are required. However, if the deeper lines become etched in, then Botox alone will not do the trick. Additional treatments like fillers and lasers, along with Botox, may be necessary. We are all getting older, what’s the alternative? The bottom line is there is an individual choice to be made by every one of us – are we ok with having wrinkles or do we want to avoid them? 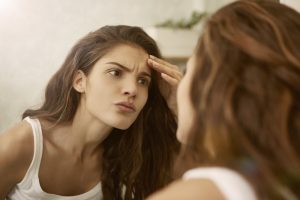 If you fall into the camp that believes the best wrinkle is the one you never get – then keep an eye out for your sweet spot, Baby Botox is here waiting.